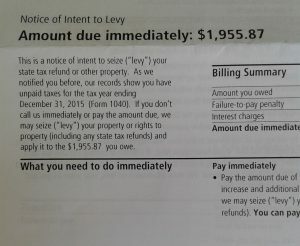 I recently received a Notice of Intent to Levy by certified mail, after only one prior letter about my unpaid 2017 taxes. In past years, I have received this notice after two or three other letters. Click the link above to read more about what the IRS typically does (and what they’re allowed to do) when trying to collect unpaid taxes from war tax resisters. Are you a current resister? Have you experienced a shift in how the IRS communicates with you this year? Let us know in the comments or contact the NWTRCC office. I have just read the NWTRCC brochure on collection for the first time in quite a few years. It reminds me of the need for what some people in long-term careers call continuing education! Even the seasoned resister like me would do well to review the easily available and informative literature available from the excellent resource NWTRCC! WTR literature is updated periodically. My experience of inheriting federally taxable income should be highlighted. Most people have the mistaken belief that small inheritances are not taxable. My inheritance was in the form of IRAs and annuities which became taxable when I withdrew the principal balances. You can limit tax liability by a gradual withdrawal. However if you are in active resister during that you can limit tax liability by a gradual withdrawal. However if you are an active resister during that period, the IRS will be receiving notices of these accounts and may then initiate seizure. To avoid that possibility, I fully withdrew the amounts in the accounts thus incurring a higher tax liability. I have been surprised that in spite of having a tax liability of over $200,000 at the moment, the IRS has yet to initiate any Collection action beyond the normal letters. This of course could change tomorrow. This is my second year of active tax resistance and I haven’t heard anything at all from the IRS (yet), so I’m wondering about the time frame on these letters. How soon after the tax deadline did people receive them — months, years? A separate letter/set of letters for each year of uncollected taxes, or all together? Ilene, I hate giving this answer, but it depends. Without knowing more about your situation it is hard to say. If you do not file an income tax return, you may not hear from the IRS for years. If you do file an income tax return, you usually receive some notice during the summer months that you owe the money. If you would like to talk to someone more about it, I’d recommend contacting a local WTR group (https://nwtrcc.org/contact/contacts-counselors/).